Any one got one ? Is there an original issue one? Have you got a picture, or a link to a site that shows what they look like? I don't think I have seen one before. I am picking we are talking fixed flip sight, rather than an adjustable one. 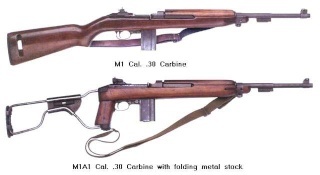 IBM, the chances are that the barrel may be slightly bent to the right on your carbine, or that it has been rebarrelled and the new barrel has been nipped up a fraction too far. This would have the effect of positioning the frontsight blade slightly to the left of the bore, making the rifle shoot to the right. You can check this by stripping your carbine and placing paralells on the barrel flat and action flat on the underside. If all is correct they will be in line. Either of these problems can be easily corrected. 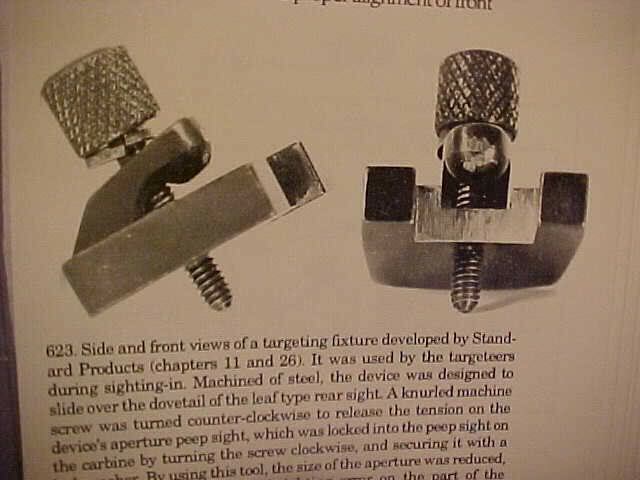 There were two developed, one for the leaf/flip, and the other for the adjustable. I'll try a leaf pic first. Mike. Can't get the pic thru tonight, will try again tomorrow. Mike. Sorry about the bad pics but I had to take them from a book. Don't forget the groove the sight base slides into is tapered. The left hand side is the small side so they have to be removed from left to right. Pushing the base of the sight too far to the left may damage your receiver. Another thing to consider is that if you move the sight base you may be damaging the original "staking", which from a collectors point of view is a bad thing. Hope this helps. Mike.